Below is a collection of albums featuring The Famous San Diego Chicken. Click on the picture to be taken to that specific album. This album contains many photos of The Chicken performing various comedic routines at many different venues across the country. The Retro Chicken album shows The Chicken in his throwback feathers. See what items The Chicken has been featured on, including cereal boxes, baseball cards, and merchandise. 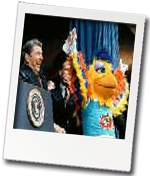 See who The Chicken has rubbed elbows with; television personalities, famous athletes, even Presidents!